Rubio Campaign: Vote For Kasich In Ohio To Stop Trump "If you are a Republican primary voter in Ohio and you want to defeat Donald Trump, your best chance in Ohio is John Kasich," Rubio spokesman Alex Conant said on Friday. Marco Rubio's campaign is encouraging voters in Ohio to vote for its governor, John Kasich, on Tuesday in a strategic effort to stop Donald Trump. If the goal on Tuesday is for his GOP rivals to blunt Donald Trump's path toward the Republican nomination, Marco Rubio's campaign has an unusual solution — don't vote for the Florida senator if you live in Ohio. Alex Conant, Rubio's communications director, admitted on CNN Friday that the best way to stop the real estate mogul in the Buckeye State would be to vote for the state's governor, John Kasich, while Rubio is best positioned to stop Trump in the Sunshine State. "I'm just stating the obvious," Conant argued. "If you are a Republican primary voter in Ohio and you want to defeat Donald Trump, your best chance in Ohio is John Kasich, because John Kasich is the sitting governor, he's very close to Donald Trump in some of the polls there." Rubio later echoed those comments himself at a news conference in West Palm Beach, Fla.
"Clearly, John Kasich has a better chance of winning Ohio than I do, and if a voter concludes that voting for John Kasich is our best chance of stopping Donald Trump, that's what they'll do," Rubio said. Kasich's campaign responded, pointing out that Conservative Solutions PAC, which is backing Rubio, has been blasting Kasich. "We agree with the Rubio campaign that the best chance to beat Donald Trump in Ohio is by voting for John Kasich, and in that spirit, Sen. Rubio should immediately tell his superPAC to stop attacking the governor," Kasich spokesman Chris Schrimpf said in a statement. Even though Kasich's campaign didn't reciprocate the strategy, it's one that 2012 GOP nominee Mitt Romney has urged anti-Trump voters to follow in their respective Tuesday states. 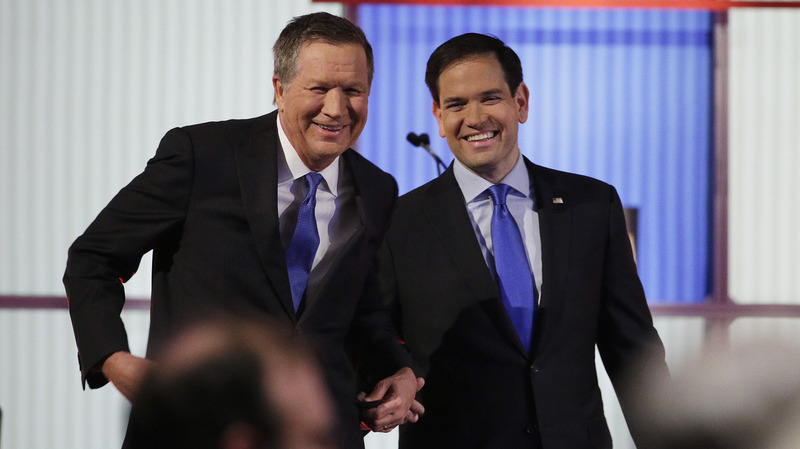 Recent state polls have shown both Rubio and Kasich trailing Trump, though. The March 15 primaries could be the last gasp for those hoping to stop the GOP delegate leader. In the winner-take-all contests, 66 delegates are up for grabs in Ohio while Florida has 99 to win.